Spent the afternoon yesterday practicing my U-turns at this college parking lot. My buddy Brian came out with me to practice his braking. I've been wanting to get to a point where I can lock the handle bars all the way in one direction, and effect a full circle, in a smooth and graceful manner. Just like the cops. I've practiced this before, and was able to do some tight circles, though still not with locked handle bars all the way around. Plus I wasn't leaning enough, and I wasn't exactly smooth and graceful. I even caught myself putting my foot on the ground when things got too wobbly. But today, I think learned something. Sitting up straight gives me more reach. On my Ultra Classic, I've always sat in a slouched position whereever I ride, and in the past I've practiced my slow-speed turns in that position as well. Slouching makes it more difficult for me to reach the handle bars when they're locked all the way in one direction. For whatever reason, I feel more relaxed when trying to make those turns. After being used to sitting slouched on a bike, sitting up straight tends to feel like I'm riding someone else's bike, where I know how to ride it but it all seems new. Later, Brian and I decided to switch bikes. He has an Ultra Classic also, the same year, 2005. But the front end felt lighter on his. It was like I had total control in turning the bike; it responded completely to my input. Interestingly, Brian said that when he turned the handle bars on my bike, the bike wanted to lean, which perhaps is a good thing or bad, depending. I think it was a round-about way of saying the front end felt heavier on my bike, and that it was trying to dictate what to do. I'm assuming we have the same front end, with all the same parts. And have the same Dunlop tires. But I think I learned something about riding a bike today; it helps to sit up straight. Each of us started out with an idea of where we wanted to go in our lives, but the road we travelled down always took us somewhere else. One of the favorite pasttimes my wife and I had years ago was finding a major avenue or boulevard, and following it until it ended. Sometimes it would take us a few miles, but sometimes it went for 25-30 miles. It would take us into towns and communities that we never ventured into, and we'd point out interesting shops and stores passing us by. Wherever the road ended, we'd find a restaurant and have dinner there. One particular road we explored led us to a neighborhood with brand new homes being built. We stopped to look at the model homes. We had a lot of fun. Over the next several weeks, we took up a new hobby of touring model homes all over that region. We questioned if maybe the time was right to sell that cramped condo and get us a real house. That's how we found the home we live in today, by choosing a road and following it. My parents divorced when I was seven. I was an only child. My father was a sailor in the Navy, and as it was I hardly saw him anyways. Both my father and mother ended up remarrying to different people, and had new sons all over again. Had my parents stayed together I might not have harbored this frustration for having lost my family and becoming the jealous step-child. I wouldn't be the angry, opinionated, motorcycle rider I am today. 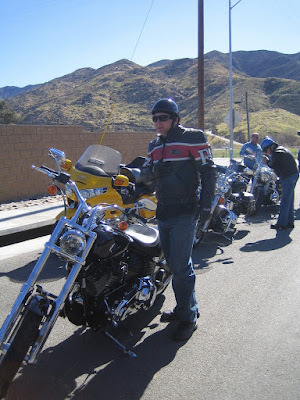 And the road would not have brought me to my wife of 19 years, to the career path I ventured down, to this home that we bought, to this small business that we started, to the motorcycles I now own, to the friends I have today. But yet I look around me and I feel blessed. Of course, I could have had all those same things had my parents remained in love and raised me in a happier disposition. But then, what difference does it make? I'm happy now. Just a couple of days ago Joker pointed out that in his riding club, a riding plan must be planned out in detail and cannot be changed by anyone but the road captain. And if a road captain isn't there, the ride is off. But in our riding club, we come up with a plan, start down that direction, and then let the road throw its ideas at us. You might decide to steer your motorcyle down a specific road, and you might have decided where you'll eat lunch, where you'll get gas, and where you'll take a pee, but you'll never really know what you'll get until you ride it. But what you do know is that you have some good riding buddies, and plenty of good sunshine. 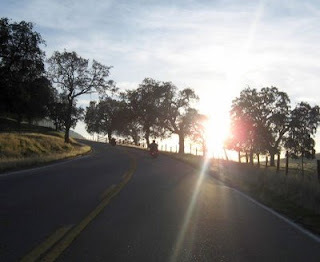 I've always enjoyed reading Dylan Weiss' blog "Twisting Asphalt", where he describes his thoughts while piloting his fleet of Ducati motorcycles across the roads of Southern California. "Forty-five minutes later I'm taking a mellow stroll down a quaint if not quiet canyon road while basking in that uniquely Ducati inspired sense of time and place and purpose. 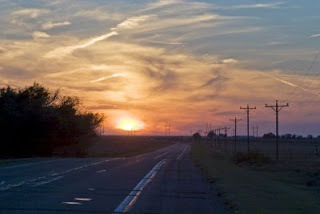 From the road, to the ride, to the sense of life that surrounds it, I feel certain that I'm destined to be here. To live life in this particular moment. When the world finally feels like it's turning true once again. " That's not anything one can write only from a darkened office behind a computer keyboard. One has to experience the feeling of racing up the back of an asphalt laden snake slithering across the chaparral and sage brush of the California outback. But does one have to ride a Ducati to find such artful words and phrases? Or can a Harley rider like me still convince the wind and road to release such inspiration? I was interested to learn that Dylan crashed his bike just a week ago. He says it was his first crash. And apparently it was just a matter of not seeing the sand in the road. Perhaps his mind was gathering literary material from the elements, or perhaps it was that spattering of shadow and sunlight cast from the trees that seemed to mesmerize. Southern California is a desert landscape marked by ranges of mountains and hills, and when the Winter rains come in, it carves out canyons and washes. From there the water carries sand and silt towards the roadways. Pools of water collect in the corners of cambered curves. As they evaporate, they leave behind patches of sand. Even if you're watching the road carefully, you're still left rolling the dice as you're leaning into a blind curve. For me, it's a humbling experience each time I crash my bike. Stuff like sand and water in the road always grabs my attention, and if I have to navigate through enough of that stuff it makes me wonder if I'm even having fun anymore. But eventually Summer comes around, the sand and water goes away, and gone with them are the memories of Winter riding. Perhaps in other parts of the country the Winter weather and road conditions are so bad that folks just don't bother riding at all. But Winter time in Southern California still has plenty of sunshine and temperatures in the 70s. 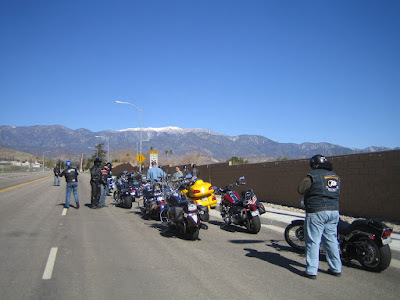 The days are so great that riders are beckoned to brave the roads, sandy curves and all. And henceforth comes a crash like Dylan's. So with his first motorcycle accident under his belt, I wonder if it will add some bit of dimension to the thoughts he composes into binary form. The road always collects its dues from each rider. I think about the accidents that I have had in my years of riding, and everytime I ride they are fresh on my mind. They affect they way I now ride a motorcycle. And one thing I realize now, is that those accidents have also affected the thoughts I express. My friend Mike is just getting started in homebrewing, and suggested to our riding club that we do a ride to the homebrewing store in San Diego. 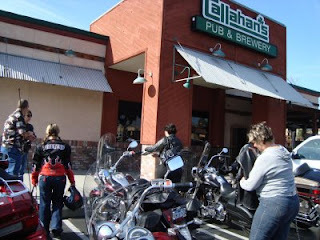 Part of the lure for this ride is that the homebrewing store is connected to a brewery that offers tastings. Only a few of us could resist. 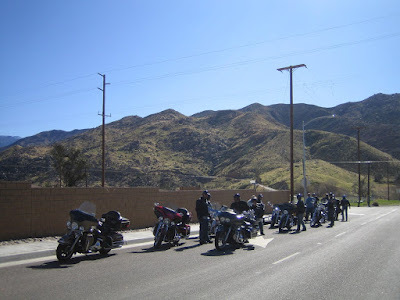 He had worked out a route that would take us there, and afterwards, lead us along some scenic canyon and mountain roads to a restaurant in Ramona that he had heard about on television. Then, some more twisty riding back home. We got to the homebrewing store too early! They opened at 12:00pm, and we were there at 11:30am. My buddy Brian suggested we keep on riding, perhaps going out to the coast and seeing the ocean. Since I did a lot of growing up in San Diego, I led everyone out to the national cemetery on Point Loma. There we could take in some fresh ocean air and gaze at the city skyline, and see the tombstones of soldiers who served in the Spanish American War. We probably wasted about an hour total. So we finally got back to the homebrewing store around 12:30pm. Then we all got several rounds of beer samples, and talked to great lengths over the differences between centennial hops and columbia hops, how roasted malt gives a porter its burnt flavor, and how aerating your fermentation works better than just shaking it. Stuff I don't totally comprehend. It was around 1:30pm by the time we got out of there. And my friend Brian, who also happens to be a homebrewer, had been wanting to visit the Coronado Brewing Company, and I know they happen to serve up great food. And by this time we were all really hungry. 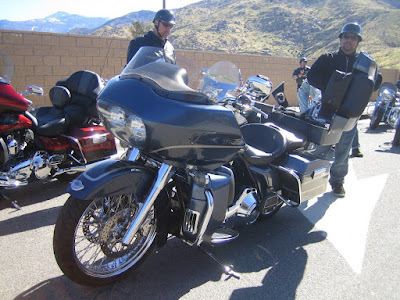 The ride to Ramona for lunch was still another 90 minutes away. Just didn't want to wait that much longer for food. So he and I convinced Mike to change his plans by having lunch at Coronado Brewing Company. He agreed. So off we went, up and over the Coronado Bay Bridge, where we got stellar views of the San Diego Bay, and then over to the Coronado Brewing Company where we drank more craft brews, and stuffed our bellies rotten. By the time we got out of there, it was WAY too late for us to do the route back home that Mike had originally planned. I remember a few years ago when we did something like this before, where one guy worked out what he thought was a great route through some great roads, only to have the rest of us decide to change his plans, just because it sounded good. And that got that guy pissed off. Just pissed him off that we would suggest doing something different from what he had planned. So today, I chose to compliment Mike for suggesting that we visit the homebrewing store, because if it weren't for that we would not have visited a national cemetery, enjoyed the great views of the city skyline, breathed in some ocean air, rode over the Coronado Bay Bridge, and then finish it off with some great food and beer at the Coronado Brewing Company. And then I apologized for trashing his original ride plan. Mike seemed to take it really well. Not that Mike's original plan wasn't good. It sounds really good actually. It's just that sometimes things work out much differently in reality than when you plan it out in your mind. I can't help myself from mourning the loss of what motorcycling once was. In those days we would leave on an overnighter or gypsy tour with just a ground cover and a blanket. Now hotel reservations are made in advance and only after searching the web to be sure there is a pool, Jacuzzi, wet bar in the room, a masseuse and complimentary cocktails on the veranda. He finishes his article by telling all such motorcyclists to stay far, far away from him. I'm not so sure that motorcycling is really any different than it is now. He goes on to complain that bikers need to pack their cell phones and laptops, but then again, nobody had these devices in the 1960s. Is he saying that in the 1960s not a single biker ever packed a transistor radio? Is he saying that in 1960s, not a single biker ever overnighted at a motor lodge? Just because cell phones weren't around in the 1960s, doesn't mean bikers would not have wanted one.